306 pages | 146 Color Illus. Diversity and Design explores how design - whether of products, buildings, landscapes, cities, media, or systems - affects diverse members of society. Fifteen case studies in television, marketing, product design, architecture, film, video games, and more, illustrate the profound, though often hidden, consequences design decisions and processes have on the total human experience. 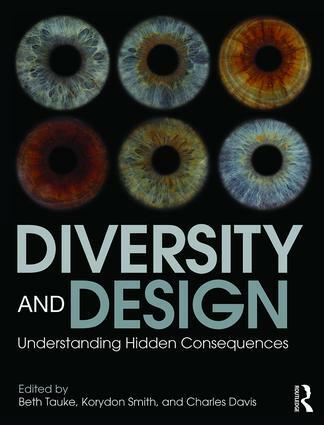 The book not only investigates how gender, race, class, age, disability, and other factors influence the ways designers think, but also emphasizes the importance of understanding increasingly diverse cultures and, thus, averting design that leads to discrimination, isolation, and segregation. With over 140 full-color illustrations, chapter summaries, discussion questions and exercises, Diversity and Design is a valuable tool to help you understand the importance of designing for all. Beth Tauke is Associate Professor of Architecture at the University at Buffalo—State University of New York, USA. Korydon Smith is Associate Professor of architecture at the University at Buffalo—State University of New York, USA, and the editor of Introducing Architectural Theory. Charles Davis is Assistant Professor at the University of North Carolina at Charlotte, in North Carolina, USA.